It is hard to expect much when it comes to pizza in Las Vegas, especially when you just found the secret pizzeria in the Cosmopolitan Hotel and it blew you away. We decided to make a reservation at D.O.C.G upstairs and try out the offerings they had. Luckily enough we made our reservations early, since this place seems to pack up around the weekend evenings. D.O.C.G has an outdoor eating area, and although I was well aware we were indoors, it really did give me the feeling of being on an outdoor walkway enjoying a meal, that is if we got a seat outside. We ended up inside and I noticed they had a pizza on the menu. I ordered a Margherita and prayed for the best. 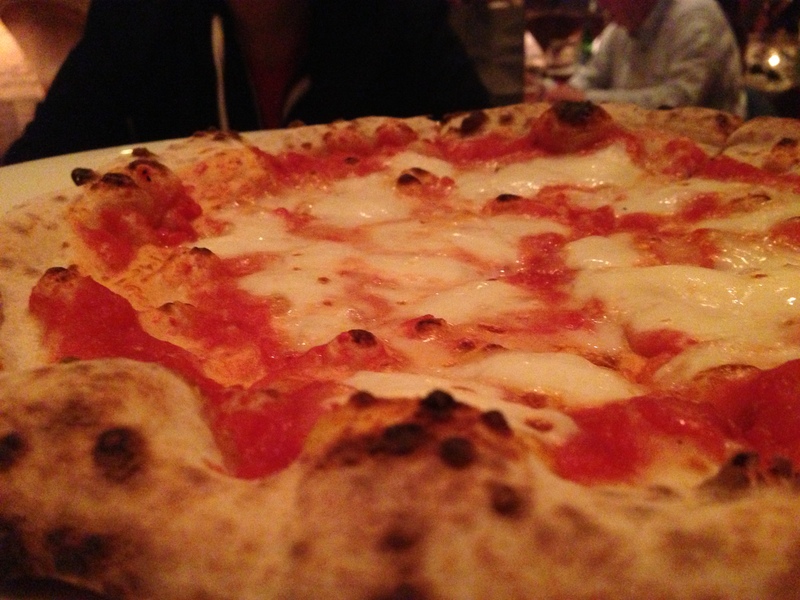 The pizza arrived out pretty quickly, and was certainly a Neapolitan style pizza, which many people tend not to enjoy. 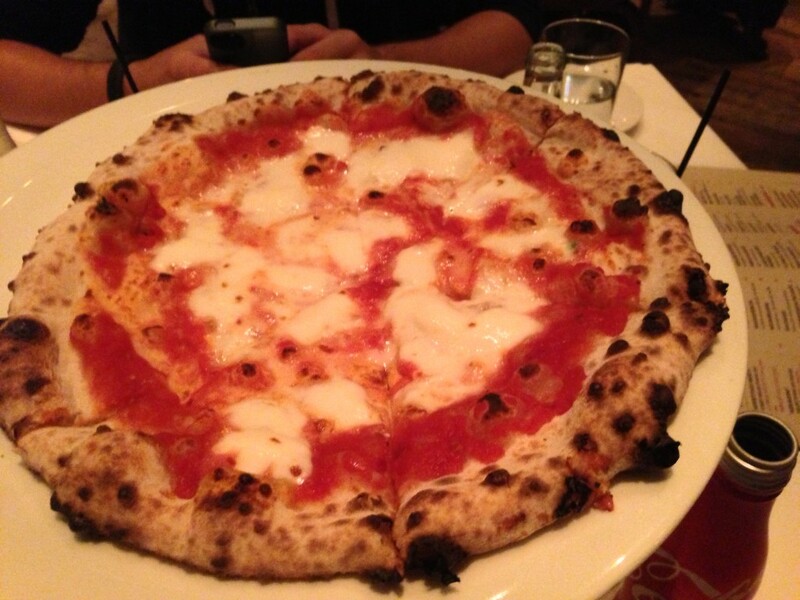 Neapolitan pizza is very doughy, fast cooked, and without much cheese. The cheese that is used is usually a Fresh Bufala Mozzarella or just Fresh Mozz in general. 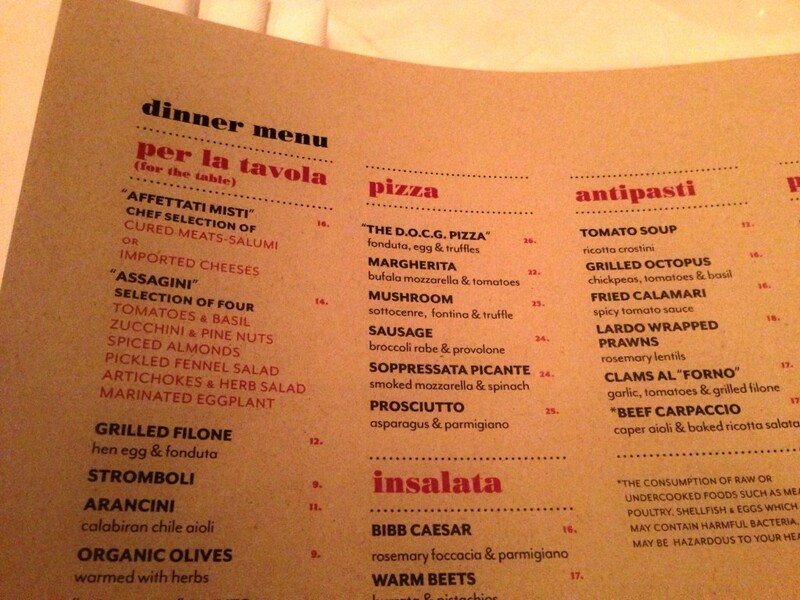 This one tasted like Bufala Mozzarella, and upon further inspection of the menu, it was confirmed. Since this pizza came out so fast, I had to end up sharing this already small pie with the rest of the table. So after four people got their hands on a slice, there wasn't much left for me, and at $23 for this little pie, I really expected it to be more sizable. Like most Neapolitan style pizza, my first bite consisted of pulling off most of the cheese, and the sauce underneath it. I do not really care for this style pizza due to that occurrence. I have heard many a Italian pizza chef tell me that if a place knows how to make a pie like this, this shouldn't happen, but I have had this style pizza around the world, and it happens everywhere. The pizza really happened to taste good though. The cheese was amazingly fresh, and the sauce was sweet but with a few chunks. The dough was very good on this mini pie. It had a charred taste, but was quite soggy on the bottom. This pizza could have benefited from another minute, since as you can see by the cheese, it wasn't fully cooked. If at the Cosmopolitan Hotel in Las Vegas, I would go back and try this again, but at $25 it makes it very hard for me to go out of my way. The taste was really good, but at the current cost, it prices me out and I am sure many others as well. D.O.C.G in the Cosmopolitan Hotel in Las Vegas gets 5 out of 8 slices.